Monitor on Massacre Marketing: Syria Chlorine Allegations: Where Was Dr. Tennari? 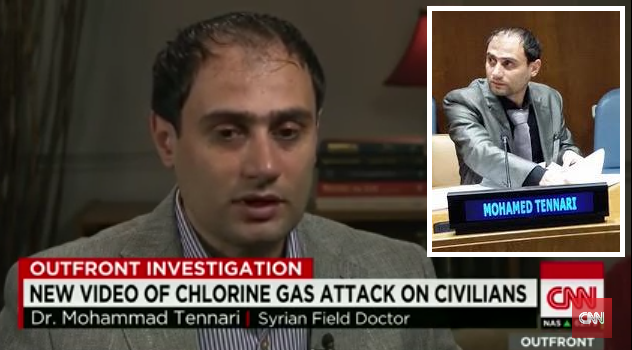 Syria Chlorine Allegations: Where Was Dr. Tennari? 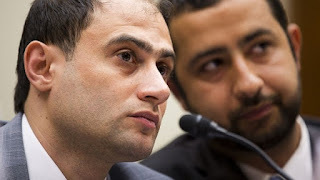 Dr. Mohammed Tennari is the Idlib province Coordinator the Washington DC-based Syrian American Medical Society (SAMS), a group opposed to Syria's government and allied with the competing "transitional government" in Turkey. Not far cross the Turkish border in northern Syria, Tennari set up his Field Hospital in the city of Sarmeen (alt. 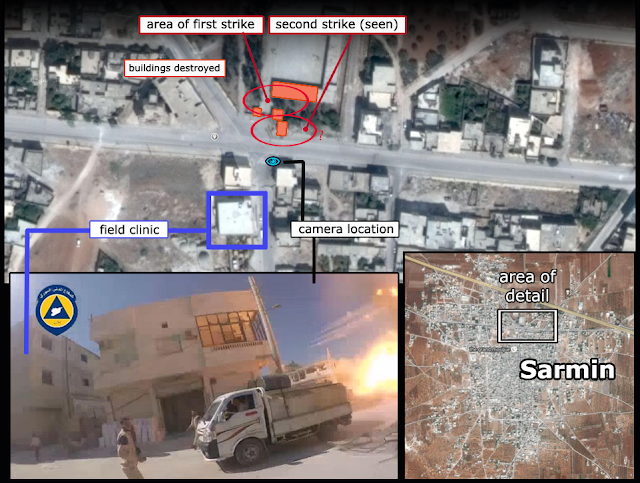 Sarmin - clinic logo at left), southeast of the regional capitol Idlib. This reportedly was started in 2011, supported with funding to hire staff, secure supplies, etc. from SAMS (SAMS), as well as Doctors Without Borders/MSF (MSF), and it continues running today with an unusually transparent and public medical process (see the clinic's Facebook page for intensive surgery documentation). ﻿﻿Tennari's main thrust and selling point in these lobbying efforts has been relating his direct experience with the government's intolerable chlorine barrel bombs. He came on the national spotlight after his clinic hosted the deaths of three young children, aged 3, 2, and about 1, on March 16, 2015. 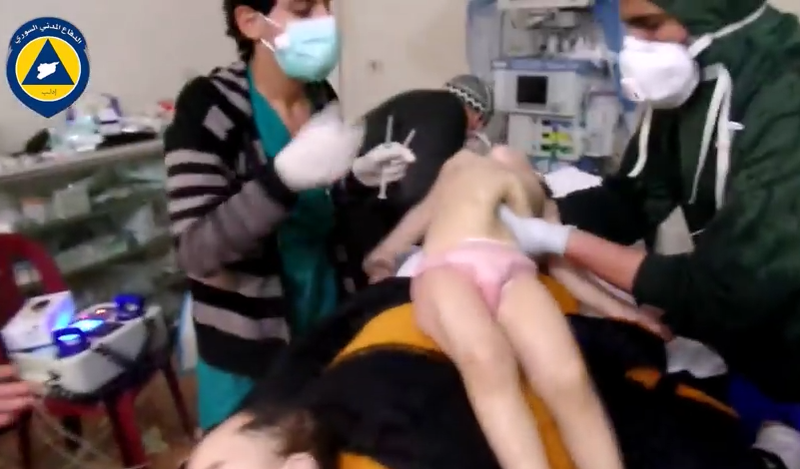 It was the first and worst of the new round of alleged chlorine attacks in Idlib. These deaths were exactly what he showed to move the UN to tears and, apparently, short-circuit their analytical skills. We know Al Qaeda's branch in Syria, Jabhat al-Nusra, was at the time of the incident the leading force deciding who lives and who dies in the Sarmin area. The area would still, even after all the running so many have done, contain some religious enemies - Shi'ites from the nearby and vulnerable village of Fu'ah, Sunnis who they think support the infidel government, etc. These might wind up dead in fits and spurts as soon as there's a good cover story and some fake names lined up. He doesn't explain why he could not get that mask back on Mohammed's face, for one thing. Maybe it's part of the (Islamist?) "fate" concept Civil Defense ("White Helmets") chief Raed Saleh talked about; referring to one of Mohammed's sisters, probably Sara Taleb, he said "we did what we could to save her, but dying in silence was her fate. Death in silence before the whole world.” Why is this their "fate" in anti-government hospitals? Why the combination of preventable death, and a global audience for it? The answer can perhaps be sensed in the accompanying calls to "stop the death" - not by enforcing proper medical procedures in this or other rebel clinics, but by starting an air war against the religious enemies of the people the clinic managers are allied with. Was He Even On the Stage? As the New York Times related, Dr. Tennari "tried to save the three children shown with their grandmother’s body in the video that he said was taken that night." From this, there's little reason he should not be seen in that same video, or set of two videos rather, filmed mainly right around the children as they died. These show everyone who was that close to the central drama, but Dr. Tennari does not seem to be one of them. It's all but impossible to prove a negative like his not being at the clinic, but from the available video, we can see that he probably wasn't there, and he almost certainly wasn't in the emergency room at the crucial time. 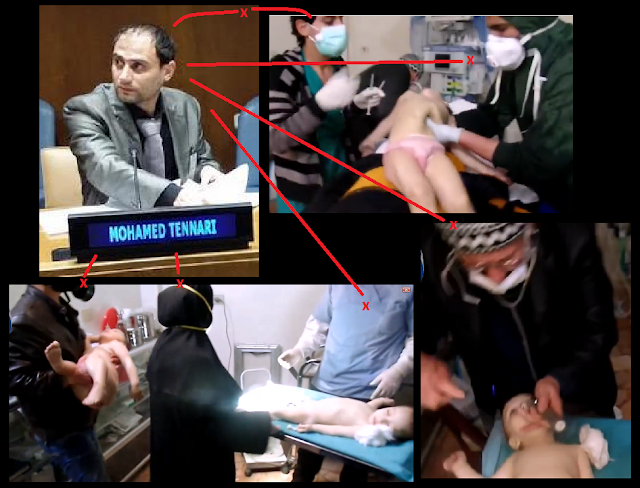 And here are the emergency room videos, apparently what was shown at the UNSC and for the HFRC, as Dr. Tennari sat there claiming his central involvement in this drama. Can anyone spot him actually in that drama? I can't. In the first one, we can see only Mohammed is there at the start - anyone helping prior to this wouldn't be treating "children," just the one child. Mohammed is alive at the beginning, the girls are brought in halfway through the video, and one person says Aysha is alive (breathing) near the end. In video 2, they all increasingly seem dead. There's little to no gap between the videos, which show the time when the children died. Any life-saving efforts on them would happen in this span I estimate at 4-6 minutes long. And we see life-saving-type efforts, just poorly done, and mainly after the kids are dead. 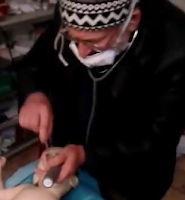 Dr. Tennari is not the cameraman for either video, we can presume, so should be one of the people seen, eyes burning or not, hunched over the victims at least part of this time. There are 7 people of medical relevance outlined here at ACLOS, numbered in order of appearance. Two of these - M1 (right, wearing the Taqiyah cap favored by some Islamists) and M6 (below, on the left) seem to be - or be considered as - qualified doctors. Neither of these men is Dr. Tennari; M1 is too old and lean, while M6 is younger and has all his hair. Is he one of the rescue workers whose faces we can't fully see? Visually, M4 or M5 (on the right below, holding Aysha so gingerly) could be him, but the director isn't likely to be working with the rescue teams like that. Is he hiding under a hijab as the one female nurse, M2? Is he one of the other, less relevant, people here? Or is he simply not in the room? Consider M6, the young doctor (on the left in the image at right). For most of video 1, he's consistently not seen or sensed in the room, until he appears from the back at 1:34. From there on, he's clearly in the action through both videos. Dr. Tennari seems to be missing in that same way, but for the whole time. A less thorough scan of videos from other parts of the filed clinic also failed to reveal any matches. He may have been on-site, just out of frame at times, maybe he is visible and we just can't see it yet, or he may simply not have been there. It's a valid question, then: where was Dr. Tennari? * Was he there after all? Can anyone out there locate a possible match? Comments below are open. 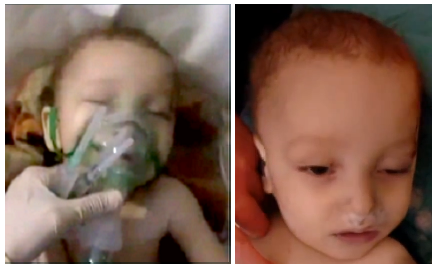 * He would have less reason to be in New York or Washington before he and his clinic delivered their chlorine attack and dead-babies story - but he is with SAMS, if not a Syrian-American himself. So maybe he was in the US. * Maybe he was off in Turkey, or even Qatar for example, securing support. * Maybe he was working elsewhere in Idlib, or elsewhere in Syria, or was at home like he says, but passed out drunk, or something embarrassing. * Consider: he works and lives mainly in an area run by known terrorist groups and their ideological allies. For all we know he was briefly arrested that night so others could manage the clinic for a while - maybe he had nothing to do with the crime spree (see below), but can't say anything or they'll brand him a regime collaborator, execute him, and his children will be the next random victims of "Assad shelling." That's an overly-imaginative scenario, but there are a lot of possibilities in that direction, tainting his reliability as a witness. All we know is he flew out of this terrorist-held area to the UN and Capitol Hill and issued some softened demands, something about delivering explosives to kill the religious enemies of those terrorists. All pure coincidence, right? An important point I've been half-aware of half the time this post has been up. Dr. Tennari, I presume, is seen in this video ("testimony of director of the hospital for cases affected by chemical gas") filmed apparently at this clinic during the events in question. It was posted quickly, before 9 am on the following day, and seems filmed in the dark hours. He has the dark rings of no sleep under his eyes, and seems strangely out of the loop, in street clothes with no gloves or scrubs, seemingly trying to avoid eye contact with the whole room as others bustle about treating patients. His clothing helps clarify he's not even the guy in the green hoodie above, and simply wasn't in the ER when he says he was. In this new Al-Jazeera English report, Dr. Tennari describes himself as hectically running around from one patient to the next, and the whole scene was "noisy." Is that his way of explaining why he doesn't seem to appear in the ER videos? It doesn't seem to match what he is seen doing - chatting on the sidelines in street clothes as if he literally had nothing better to do. On June 17, Dr. Tennari presented alongside former ambassador to Syria Robert Ford, and border doctor Annie Sparrow (her "voice cracking with emotion"), who also happens to be the wife of Human Rights Watch CEO Kenneth Roth. All three were quite clear and professional on the point that that the government and its helicopters were behind these chemical attacks, and ideally at least, they should be stopped with some sort of aerial solution. None of them makes note of the unprofessional medical care that contributed to the deaths. "Sure," Dr. Sparrow might as well have responded, "just get that protective solution in place so the death can stop, like we did in Libya." the victims in this deadliest chlorine attack were visibly not killed by chlorine at all. As best explained in the previous article What Killed the Talebs? the children, especially Mohammed, show signs consistent instead with an overdose on some CNS depressant drug, most likely some kind of opiate. This is seriously the best visuals-based assessment anyone has yet made (but open to review). A drug overdose of course would not come from a barrel bomb, but from a person in this Islamist rebel-administered area. In the case of the girls anyway, and likely with Mohammed as well, the drugging happened before they were brought into Tennari's clinic. But it was probably done by friends or overlords, and still perhaps using drugs supplied to him by MSF or SAMS and somehow "loaned out." There was a chemical murder in the area, and a staff that had chances to stop it, but let these pass. Why save a life if the plan is to end it? But why would the same plan hold into the clinic, past its ethical gates? This really should be considered carefully, and as Tennari and his allies ask, with an eye to some kind of punishment for the perpetrators. It's a at least as hideous a crime as they say, besides being an elephant-in-the-living-room insult to our collective intelligence. If the facts are as the visual evidence suggests, Dr, Tennari is complicit in these murders and the cover-up. And it's not even a very good cover-up, just one that the ruling elite is very hungry for. Some noted possible inconsistencies between Dr, Tennari's various accounts - mostly to be expanded on later - there may be others I forgot. First, No one is seen fainting in the videos. Next, it's unlikely chlorine gas will drift or even rub back off a patient's skin or clothing enough to do anything, in the war Sarin easily could. It changes to hydrochloric acid on contact with water (so eyes, airways, maybe skin), so surface particles could irritate, even float up into one's eyes, maybe, off the clothes of a freshly exposed victim. But from what I've read, passing out would come only after severe exposure to an air-borne cloud of the stuff, after coughing violently for a while. 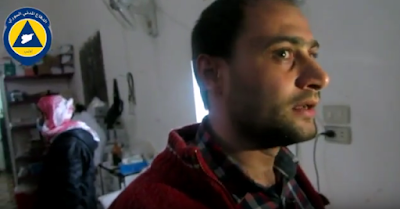 Mohamed Ghaleb Tirani, the director of the field hospital in Sarmin who treated many of those affected by the attacks, told Human Rights Watch that the patients’ clothes smelled strongly of chlorine – “like the detergent.” ... Tirani said that four of the paramedics at the hospital were affected by second-hand exposure, including burning eyes and shortness of breath and dizziness. The problem with this, as anyone who's reviewed the videos or who was there should know, is the children at least had been stripped and washed before arriving in the clinic, as anyone can see looking at the videos he presented. Most other victims, if not all, seem to be similarly stripped (usually to underwear) and washed with water out in the street, then given a civil defense blanket and taken inside. It's true grandmother Ayosh is not processed, and seemingly remains in her clothes, but she's also wrapped in a blanket that would greatly mute any vapors - only her face and one arm are exposed. Dr. Tennari should probably know what makes basic sense, and even if he wasn't there himself, he should have seen the videos and thought it out before the UN session. But what he says about "fumes" rising off clothes causing symptoms that secondary chlorine exposure would not cause makes very little scientific sense. As he left his house to head to the hospital, he could smell bleach. “When I arrived at the hospital, a wave of people had already begun to arrive. They were all experiencing symptoms of exposure to a choking agent like chlorine gas. Everyone was decontaminated with water before coming into the hospital, and their clothes were taken off of them. This now is clearer in matching what the video shows, as if he had watched it. But he insists he was affected anyway, and still blames the children - just not their clothes. In the full testimony (transcript) he says "As I worked, my chest became tighter and tighter, my throat burned, and I had a hard time breathing. The young nurse who took care of baby Mohammed had symptoms of a critical level." Perhaps it's this tenacity in holding to his first story regardless of the holes in it that's got so many influential people willing to believe everything he says. Well... when he first spoke, to MSF (who support his clinic with drugs and supplies) as "Dr T, the director of Sarmin hospital" and saw this friend and his family brought in, what did he say? But then they died, except the grandmother, who he says arrived dead. But that speaking the parents did before must be how he learned who they were, at first. Later he already knew, they lived in that geo-located basement apartment in Sarmin (see here), ran a repair business in town, and Tennari was Waref's friend and customer. Talebs Gassed Through a Vent? Dr. Tennari said the gas seeped into the home through a vent: "The family lived in a basement apartment which became “a gas chamber” when toxic gas seeped in through a vent, Dr. Tennari said." (NYT) But the visual evidence shows two walls of the apartment blown apart. The OPCW investigators would later hear the barrel bomb itself fell through this vent - with "an approximate dimension of 3 m x 1.5 m" - and then knocked down the wall. "A ballistic expert analysis supports the statement of the witnesses, improbable as it sounds, that the device impacted through the ventilation shaft." (October, 2015 report, PDF) Tennari's first description could be a simple mix-up based on what he heard, or a red flag. For what it's worth, as mapped (see here), the alleged Taleb family home has always had a strange rectangular hole of perhaps this size or smaller, no bigger, along its north edge. This correlates to about where the bomb seems to have crashed through, or detonated anyway. What the hole looks like now is unclear, butit seems larger from how much light comes in. What seems like a strange new wall blocks the view. It's not a very clear situation yet. In testimony (PDF) before the U.S. House of Representatives, Dr. Tennari has cited a few symptoms he claims he observed, besides the smell, as proving the victims were affected by chlorine. * "Mohammad was foaming at the mouth. ": True but irrelevant. Only the infant does this a bit, because he's spit up and manages a few shallow breaths through the goo, causing bubbles. The girls show no such thing. And it's not a specific chlorine indicator anyway, contrary to popular belief. With the mucous produced, foaming can happen, or not. * ""(Waref), his wife, his mother, and his three young children – all under the age of three – were a sickly pale color when they arrived, a sign of severe lack of oxygen and chemical exposure." This is true for the children at least, and it's a problem. If they'd been hit with chlorine they would likely suffer some red skin irritation, besides major eye irritation, causing redness. Instead, they're just pale. Pallor is more consistent with a drug overdose. He's thinking of cyanosis (a blue shift), which they also display, slightly (this is consistent with an OD as well, if it doesn't come with other chlorine-specific signs). The grandmother has a reddish face and eyes, suggesting maybe she was exposed to chlorine, despite what Dr. T describes. The father isn't seen clearly enough, and the mother isn't seen at all. * Difficulty breathing/suffocating: Not in a chlorine sense. That would be violent coughing and visible efforts to manage lungs full of fluid and get some air in there. These kids... one (Sara) is said to be dead and seems it. Aysha is said to be alive, but never visibly breathes. Mohammed is clearly alive, as he tries one visible, yawn-like breath, and the bubbles ("foam") indicate he was breathing a bit in between. Being unresponsive, comatose, flaccid, plae, and "too sleepy to breathe" are all symptoms of a drug overdose, and roughly the opposite of what chlorine poisoning looks like. "We were forced to treat Sara and Aisha on the body of their dead grandmother because we had no free beds." Dead bodies must be on a bed, even if it complicates saving the lives of children? Did they really have no other place, anywhere, to put her that didn't obstruct the emergency room? No other beds, no morgue, no free floor space? Unlikely. It seems more likely they left her there to make a visual point about their lack of space. See our ACLOS analysis of what Dr. Tennari calls the 11th and final direct air attack on the Sarmin field hospital, in October, 2015, which he claims destroyed it totally and left it out of business. Here's where the two blamed strikes hit, relative to the untouched clinic. The damage seems to be: an (abandoned?) school and guardhouse directly hit, the cameraman's leg was injured, and he limped it into the hospital, leading to an injured knee at the hospital. Also, a photo shows a trashed room inside, with equipment strewn about, but every wall intact and not even a cracked window. Somewhere, several local men and two hospital staff members were said to be killed by this air attack. How it all really adds up remains impossible to correlate. Now note the hospital at that time is a 3-floor structure. Consider that it had just gotten that way before this. 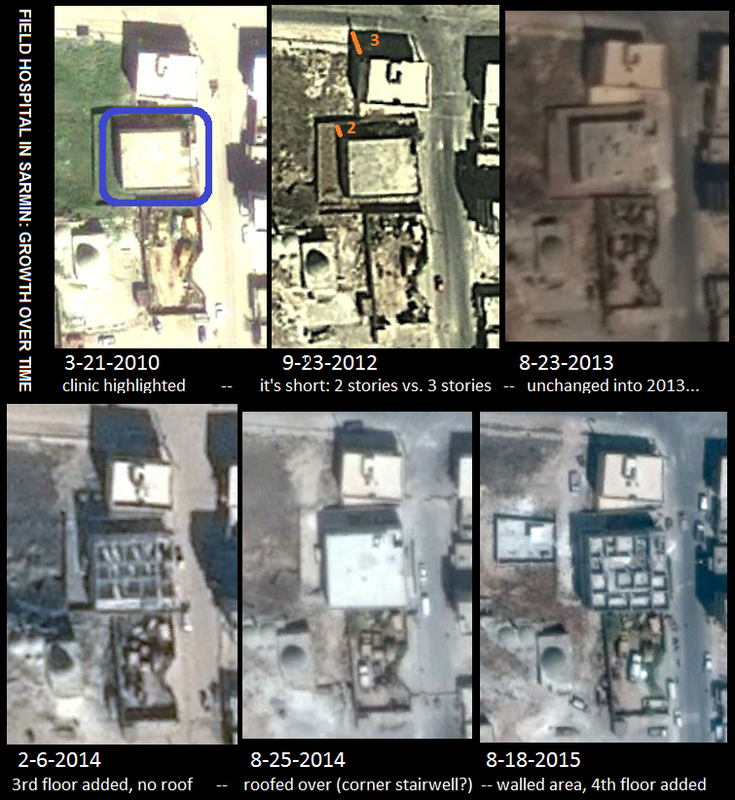 Here's a comparison of images from Google Earth showing its growth: correction, it seems to be just one floor to begin with, and the northern place two. The hospital has a second floor added in 2014, and a third added in 2015, with its roof still incomplete on August 18. In October, it seems to be roofed over: the top floor is as dark inside as the second. So whatever it means, this place had just reached full size when "Dr Mohamed Tennari, director of Sarmin hospital, said the facility appeared to have been directly targeted and could no longer serve patients on one of the fiercest frontlines in the war. He said the hospital had been the target of at least 10 other airstrikes earlier in the conflict." (Guardian) As far as I've noticed, it may have shut its doors for good. I don't think I've seen any further reports from there.